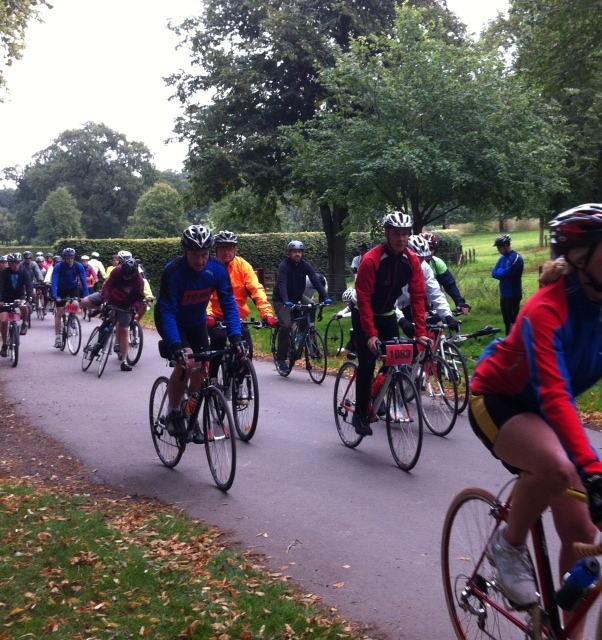 While many CTC Northampton members were taking part in “Cycle 4 Cynthia“, I attended the “Nottingham Classic“. Julian Bentley was the host/organiser and he promised – and delivered – “A Bike Ride with added Style, Culture and Entertainment”. 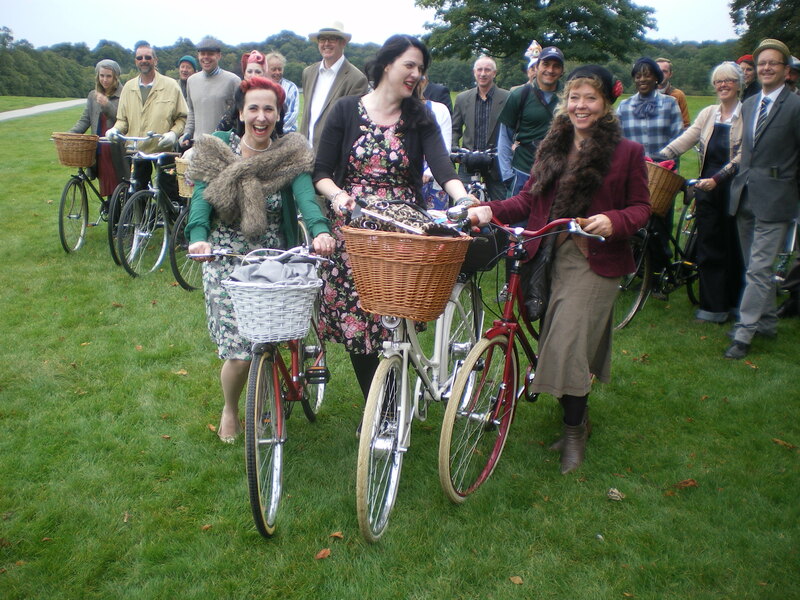 There were great prizes for those entering into the spirit of things: Gold, Silver and Bronze for each category: well-polished bikes, preened wardrobes and riding etiquette! We started from the War Memorial on Victoria Embankment, enjoyed a morning coffee stop at Wollaton Hall and had lunch at the University Park where we were entertained by Gypsy Jazz duo Maniere Des Bohemians. At the end of the ride, socialising continued in the Ferry Boat Inn, Wilford. Route here. Reported in Nottingham Evening Post. An excellent day! A fabulous time! 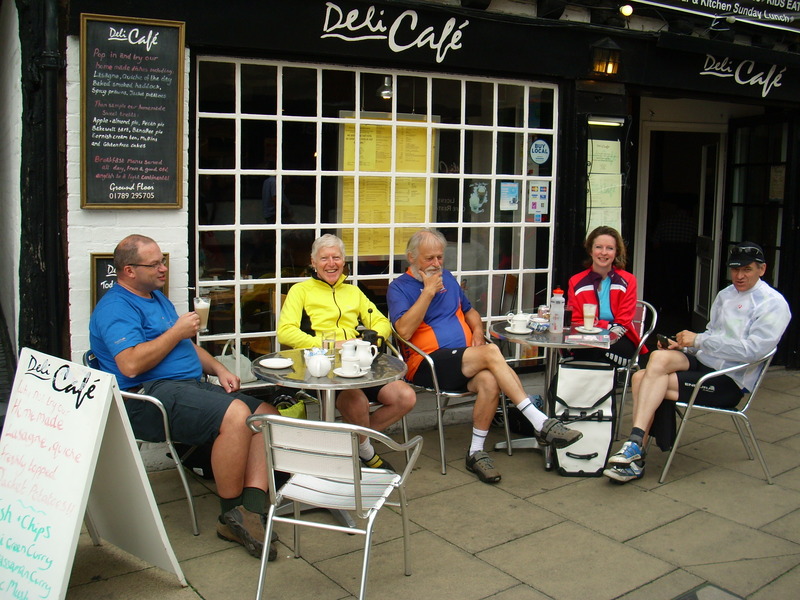 Many CTC Northampton members took part in this year’s “Cycle 4 Cynthia” Ride which started and finished at Althorp; most followed the 50-mile route. The entry fee and riders’ sponsorship raises money for the Cynthia Spencer Hospice in Northampton. (It’s a little surprising that entering and sponsoring online isn’t easier.) The hospice is named after the present Earl Spencer’s grand-mother; hence the venue at the Spencer estate. This little report is made up from contributions from David, Philip and Alex. Nick has written an account in his own blog, “Cycling Downhill”. The route had changed from previous years and there was a bit of confusion (pandemonium?) at the start as the organisers – bewilderingly – changed the start line at the last moment. With over a thousand riders, this didn’t help our plans to meet up. Five members started together and about ten others were on the ride. Two CTC couples rode tandems. Eventually riders got away by 9.45 a.m. The rain, which had been threatening all morning, came down at 12.30 p.m. and it started to get cold. This made socialising at the end difficult (everyone went straight home) but we all enjoyed the ride – or, at least, finishing it! Perhaps the nicest things about the day were the many lovely volunteers and the spectators in the rain giving encouragement to the riders. So ended the Summer of Cycling! Congratulations to everyone who finished quite a tough ride! Check out Dave’s blog “42 Bikes” for this excellent short piece on Driverless car reporting. Six of us rode out with ride leader Mike Hart today for his “mystery tour”. And mystery it remained as we headed off from the Canoe Centre blindly following our leader who refused to divulge any clues as to route or destination. We were probably all too busy chatting to really notice where we were but I did spot a sign to Harold Country Park at one point and then one to Olney! What wasn’t such a mystery were the ramps before and up to Cogenhoe – then we REALLY knew where we were-nearly home! At least three CTC Northampton members – Bill Simpson, John Weller and Ian Macsporran – took part in this event. Apologies if I missed spotting anyone else. Organised by Richard Daniells on behalf of CTC Northamptonshire & Milton Keynes, it was billed as a 110-kilometre event, starting and finishing at Oundle. The route card suggested just over 117k and, in old money, I clocked up 71 miles. The Joan Strong Centre has been the event’s HQ for some years. There’s plenty of parking in the adjacent public car park for those wimps like me who drove over to Oundle. The riders all assembled for a 9.30 a.m. start on a day of glorious weather. More than one applied sun screen. The route is glorious, circuiting Rutland and reaching west to Knossington in Leicestershire and north to Castle Bytham in Lincolnshire. I saw Bill and John at the start but by the outskirts of Oundle they’d gone! When I got to the manned control point at Ashwell, I saw them departing as I was arriving (they must have dawdled over their coffee and cake!). For me, as on the one or two other Audaxes I’ve taken part in, this was essentially a solo ride after the first few miles. Each rider chooses a pace he or she is comfortable with – and Richard’s route card made navigation pretty straightforward. There were unmanned control points at Cold Overton and South Witham. If Richard had organised the glorious sunshine, he also organised and warm but stiff southerly/south-westerly headwind for the final third of the course. The refreshments at the finish were very welcome! So many thanks to Richard – and to Northamptonshire, Leicestershire, Rutland and Lincolnshire County Councils who were kind enough to leave their roads in such a state of poor repair that my memories of the cobbled cycle lanes of eastern Germany came flooding back! John and Bill, of course, were not the sort of wimps to travel to Oundle by car but cycled to the start and home again afterwards. I reckon that must have made a day of 130 miles. Chapeau! Sadly, we didn’t get time on Saturday’s ride to visit Coventry Transport Museum’s excellent exhibition on competitive cycling, but if you have any interest in the history of sports cycles, from the early days up to and including the Chris Boardman era, the exhibition is well worth a visit. 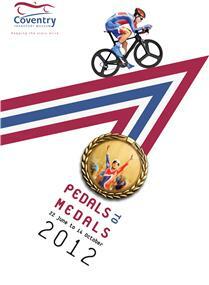 Entrance to the Pedals to Medals exhibition (and the rest of the museum) is FREE, and it runs until the 14th October so plenty of time to hop on a train (or pedal!) and get up to Coventry to view it. The museum is open from 10.00 a.m. to 5.00 p.m. 7 days a week, and it has a decent café in the foyer to boot. I was the first to arrive at Tile Hill Station followed by Rowen, Brian and John. We awaited the arrival of Iain who came by car before setting off to Balsall Common for a snack. We were shortly joined by Philip who had cycled the 48 miles from Northampton. The ride down to Stratford took us through some lovely countryside lanes, with the occasional jumbo jet passing overhead at one point. At Stratford the roads were busy but we managed the one way system using the pavements to get to the High Street. Here we passed lots of tourists to get to a cafe which had a cycle rack within view. After lunch we cycled around the Old Town centre, walked along the canal and cycled past the church where Shakespeare is buried. The return leg saw the departure of Philip at Wellesbourn (he cycled back to Northampton) and Brian a bit further on (he cycled into Coventry to catch a early train). 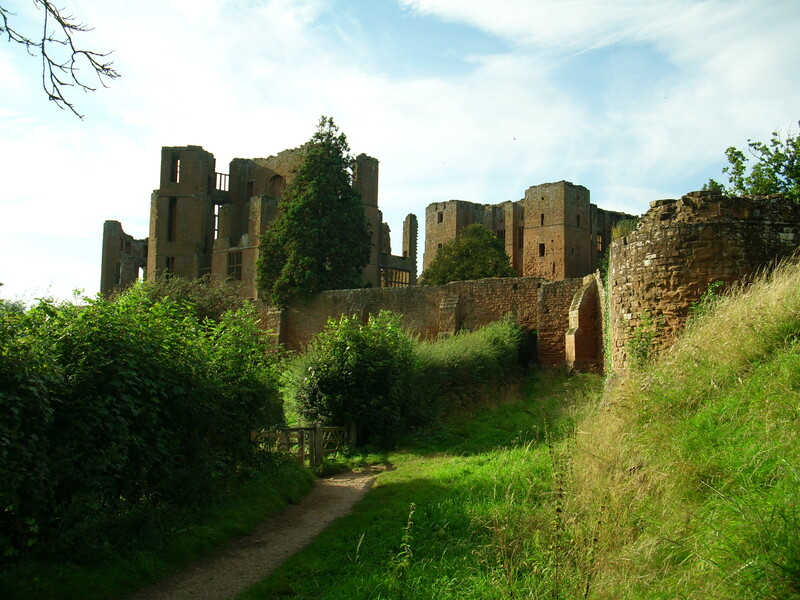 The rest of us stopped at Kenilworth Castle to view the ruins before arriving back at Tile Hill. Thanks to Iain for a well planned and different club ride.